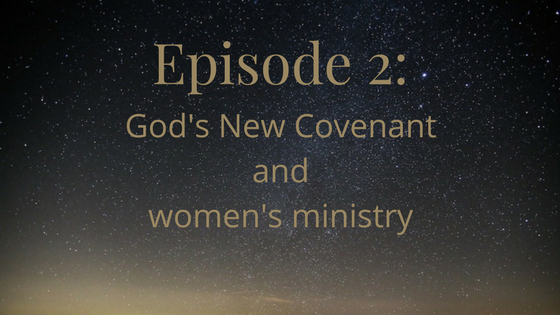 In this episode we discuss the Old Covenant and the New Covenant. This is section 1B in Traditional Quaker Christianity. We explore the differences from one to the other, and we look at how Quaker beliefs about the New Covenant result in women’s ministry. We discuss the difference between being bound in a covenant by birth and by choice. In Judaism, you’re born into the Old Covenant. If your mother’s a Jew, you’re automatically one too. In contrast, we choose the New Covenant when we choose to become part of a faith community which accepts that covenant. So what about women’s ministry? Some groups, like Quakers and United Methodists, have women preachers. Others, like the Roman Catholic Church, do not. To some people, the Church has a reputation as being against women. On the other hand, Quakers are known for having been the faith of many early leaders in women’s rights, including Lucretia Mott, Alice Paul, and Abby Kelley Foster. The early Church had women’s ministry. For instance, Mary Magdalene told the Apostles about the Resurrection first, and Junia was foremost among the apostles. So why do so many Christian groups even today not allow women near the pulpit? From the very beginning, Quakers rejected the usual interpretation of 1 Corinthians 14:34. This way of reading says women can’t ever speak in church. Other Christians of the time accused Quakers of heretical “she-preaching.” Quakers didn’t merely wave their hands and say “continuing revelation” or say that 1 Corinthians 14 doesn’t count. Instead, they pointed at the New Covenant, at Biblical examples of women’s ministry, and at passages about women giving prophecy. Nowadays, some of us even see a link between women’s ministry and traditional Quaker plain dress! Some people might see a head covering as something repressive. Meanwhile, others might see it as an acknowledgement of women’s spiritual authority to prophecy. Speaker 1: Welcome to Quaker Faith & Podcast where we will explore traditional Quaker beliefs, and variety of Quaker beliefs found today. Speaker 2: Hi and welcome to episode two of Quaker Faith & Podcast. We were talking about the Gods, old and new covenants with humanity. This is basically talking about in the Old Testament of the Bible, we’re introduced to a covenant that God makes with the people of Israel, with Jews, and there’s a whole lot of rules and rituals and all sorts of things. You’re probably familiar with Kosher Laws, things like that. Speaker 2: In the New Testament we have the new covenant, and that’s the deal that Christianity has with God, and there are some distinct differences between how exactly those work, that’s what we’re going to talk about it. Speaker 3: Yeah. Before we got started, Mackenzie and I were just here discussing the reading a little bit with one another. I was saying that I really had … I wouldn’t say I really strongly disagreed with anything in the reading that we did, but I would have gone a different direction than the authors on this particular article. I feel like the authors talked a lot. Speaker 3: Well, first of all, I wasn’t sure that they necessarily gave the old covenant enough time. I noticed they definitely spend a lot more space on the new covenant. When it’s hard, something that I’ve had to come to terms with is I’m very much … I’ve tended in my life to lean more New Testament, and take the New Testament more seriously. Speaker 3: Something that I’ve discovered for myself is just how important it is to understand the Old Testament or the old covenant. They mean the same thing, Old Testament, old covenant, to understand it, and understand it as the ground that the new covenant arose out of. You can’t understand Jesus if you don’t understand the law and the prophets. Speaker 2: I’m in trouble. Speaker 3: Well, fortunately, we do get a good dose of the law and the prophets through the New Testament, but to a great extent, just in the same way that, when you read the early Quakers, you can get a lot of nourishment from the early Quakers without ever having read the New Testament. The same thing is true with the New Testament compared to the Old Testament, there’s a lot of good stuff in there, but when you read the early Quakers, and then you go read the New Testament, and then you go read the Old Testament, it’s like peeling back. Speaker 4: I understood that reference. Speaker 2: Good point should have that scene here. Speaker 3: It’s okay. We are discussing this from a christian Quaker perspective, looking at this book that’s coming from a christian Quaker perspective, and we’ve got our biases. The fact is that you can’t really understand the new covenant without understanding the old covenant. Speaker 3: I feel like I’ve gone on about this, but the defining moment for the new covenant of course was the arrival of Jesus in the first place, his baptism by John the Baptist in the River Jordan was the beginning of his ministry. He was recognized by John the Baptist as being the Messiah, and you can’t understand what the Messiah is without knowing what the Jews expected the Messiah to be based on base in their old covenant. Jesus did his ministry, which was in the mold of the prophetic tradition, and Jesus understood himself as a prophet. Speaker 3: Now, certainly more than a prophet, but a prophet nonetheless, a root in the prophetic tradition, which you can’t. The prophetic tradition is rooted in the old covenant, it’s important to understand and Jesus has meant. Speaker 2: Right. There’s a whole lot, like when Jesus says about, “Prophets are always rejected in their hometowns.” The people they live with, don’t want to hear what they have to say. Speaker 3: There’re some background there as the prophets were frequently killed, throughout the history of the Jewish people, throughout the old covenant period, the prophets were frequently killed or exiled. The way the early church came to understand Jesus’s death was profoundly, and continues to be profoundly rooted in the old covenant. Speaker 3: All of Jesus’s life and ministry, death and resurrection is all rooted in the old covenant as it opens up the new covenant. As Christians, we understand the new covenant as fully coming into bloom, on the day of Pentecost, after Jesus’ resurrection and ascension. When the holy spirit came with power, and unifying strength, that’s something that our reading talked about, was the sense of people-ness of being drawn into unity as a people. Speaker 3: The Holy Spirit drew together of new body, a new people, a new nation you might say, but a different kind of nation in the world has ever seen it drew together a movement. That for Christians, is the beginning of us as a people, as followers of Jesus truly experiencing the new covenant. Speaker 2: That idea of a different kind of nation makes me think of like how, we’ve all got our families, but then you have those friends who are like family. The people that you choose to be with because you have something in common, and so in common other than blood line. The idea of … because of course the Old Testament, the old covenant is about a nation as in a group of people who have a shared heritage and value system et cetera. I mean, they are all descended from Abraham, right? Having the New Testament that it’s not about being descended from Abraham, but it’s more intentionally chosen. Speaker 3: It’s a breakthrough moment, I see as foreshadowing the breakthrough moment that the church has under the influence of the Holy Spirit’s, it’s a breakthrough moment for Jesus. Now, I know some Christians are going to argue with me about this, but I think it’s there in the text. Jesus is surprised, Jesus did not expect this, but yet God was opening up a salvation to all people, not just the Jews. Speaker 2: You know the Bible way better than I do, just point of clarification. This comes before the story of about like the Centurion with the servant needing to be healed and all those? Speaker 3: It falls in different places in different Synoptics, and I can’t remember exactly what the order was. I suspect it was before. Speaker 2: I went back and checked after we recorded this, and I found that the Canaanite woman is in Matthew 15, while the Centurion was actually Matthew 8. Speaker 3: You brought up the Centurion, and that’s another story, not from the book of Acts, which happens later, and this isn’t involving the church but with Jesus. You want to tell the Centurion story? Speaker 3: It’s a striking moment, and it is a foreshadowing too, I have another incident that happened in the book of Acts, which for those folks who haven’t really read the Bible very much, the book of Acts is the story of how the church got started. In the book of Acts, there’s a story where Peter, who’s a major leader in the early church, one of the 12 apostles. Has an encounter with a Centurion, and that’s where he finds out that the Holy Spirit is moving in the lives of non-Jews, and that the church, and being a disciple of Jesus is open to everybody. Speaker 3: I do think that is a theme … I actually think, now of course as Christians, we believe that God did something decisive and new, and uniquely important in Jesus. That being said, we can also see it’s not a sharp line between the old covenant, and the new covenant, it’s a fuzzy line. Jesus is there, and Jesus is the line, but there’s a progression happening throughout the old covenant towards, through the prophets giving a preview of what this new covenant is going to look like. Speaker 3: In the old covenant, the focus is on nation. The focus is on God chose Abraham, and Abraham descendants to be a special and chosen people for God to demonstrate what God’s purposes were for the world. That continues on through a lot of scripture, through Moses’s exit to the Sinai desert, and building a nation that eventually takes root in Israel, and ended up to God’s dismay having kings and imperial form of government. Speaker 3: You see that opening in the old covenant, as through the prophets and through the history of Israel. You see it opening up, and there being a hint that maybe there are people, and maybe there are people outside of Israel that really are also having a relationship with God and can be a part of this story. Speaker 2: Ruth is a foreigner too? Speaker 3: Yes. Ruth is a foreigner, and she marries into Israel. Speaker 3: Both of those women who are foreigners, and who are women are listed as ancestors of Jesus. The early church was not missing this continuing revelation you might say. With the new covenant though, it was one thing, and I do feel like they covered that in the reading from Traditional Quaker Christianity. Speaker 3: It’s one thing to say, “The nation of Israel is God’s chosen people.” But, there are some good individuals out there who are Godly upstanding individuals. It’s one thing to say that, it’s a new thing in the new covenant to say, “Who your ancestors are by blood is no longer really relevant. It’s how you are in relationship to God, and whether you’re obedient to God, and whether you’re following Jesus, that’s what’s really relevant as to whether you are part of the … as Christians would come to call the spiritual Israel.” There was this breaking down of the national barriers, in the ethnic barriers, of what it meant to follow God, and an embracing of an international movement, that didn’t depend on your bloodline. Speaker 2: The way that, that’s operating, the way we believe that operates is from the Holy Spirit. Coming to each individual person, and that’s the source of that law on their hearts. If you look at early Quakers, they’re really fond of quoting from John 1. They use the line from there, the true light that enlightened every man, they use that phrase over and over in all their writings. Speaker 2: Nowadays, we would want to translate that as every person because pretty sure they’re in, for sure the Holy Spirit’s and ladies too. The Holy Spirit is that source, and that’s a huge thing for Quakers is the Holy Spirit as even above the Bible. Speaker 2: As we were saying in episode one, that Christ is the word as opposed to the Bible being the word. Having saying, the Holy Spirit inspired the Bible, and that doesn’t somehow make the Bible more important than the Holy Spirit, that would be ridiculous. How could the book be more important than the author? Speaker 2: Foremost among the apostles. Speaker 2: They’ll say she was well known to the apostles. Speaker 3: In the past, because they knew it was a problem. It was intentionally mistranslated. I just want to say something here, the Bible, despite what a lot of people think. The Bible has been impeccably transmitted throughout the centuries and millennia. It’s amazing how consistent it’s been, it is a faithful reproduction of the document. Speaker 2: Because there’s no way they could possibly be talking about a woman. Speaker 2: That must have been a typo by the previous monk. Speaker 3: So, maybe I’d love to hear your thoughts MacKenzie, on that expansion of women’s role in a society, that we think of patriarchal societies today. The ancient world that the early church emerged into was as patriarchal as you could possibly get. Speaker 2: Well, first off if you look in the Old Testament, the priests are always men, right? Obviously the Catholic church has carried that forward, and the Orthodox churches as well, the Episcopalians are like, no. Lutherans are split on that, there’s a mixed bag there. Speaker 2: Those get interesting because if you look at the, “I don’t want to women to speak.” The context around that, it’s saying basically, ladies hold your questions until after you can ask your husband later. Which leaning over and whispering, “What does he mean by that?” Is like a whole different ballgame than actually being the person who is doing the preaching. I don’t think it’s fair to compare those two. Speaker 3: That’s a really great point, Mackenzie. The truth is, for the most part, the disciples. The male disciples come across pretty badly in the gospels. Speaker 2: Yeah, they’re really skeptical. Speaker 3: At best, they’re fools but the women come across really well and there’re some exceptions. Jesus is pretty harsh on his mom, but for the most part, Jesus is very positive towards women. It distinguishes him from his time and his cultural milieu. The same is true for the early church, as we’ve said, women were ministering and providing leadership throughout the early church. The same was true in the early Quaker movement, women were very important, both in the case of Margaret fell as a networker, and a supporter, and a protector, and also as preachers and ministers of all kinds. Speaker 2: Early Quakers got into a lot of trouble, I don’t necessarily know if this was one of the ones where they had trouble with a lot, but certainly there was a lot of propaganda out there going. Do you know about those Quakers? Do you know what they’re doing? “They have she preaching.” That was what they called it. She preaching, when they allowed a woman to preach, but of course we would say that when we speak in meeting for worship, we’re supposed to be speaking from the Holy Spirit, right? That’s prophecy. Speaker 2: Of course when you look in Acts the impossible, it says that, “God pours out his spirit and your sons and daughters will prophesy.” We know women who are in prophecy, and another one about the prophecy thing is, “Okay, if you don’t know me, then you can’t tell because this is a podcast and you can’t see me.” I wear a head covering, and that shows up in the New Testament saying that a woman has to cover her hair when praying and prophesying. Well, if we weren’t supposed to be prophesying, we clearly wouldn’t have specific directions of what we’re supposed to wear when doing it. Speaker 3: It really takes some mental gymnastics, to say that women don’t have a prophetic, and a leadership, and a teaching role in the church. Frankly, Paul’s teachings on the whole, I know I’m going to get some progressive Christians pushing back on me real hard on this, but I would say if you look at the whole Paul’s teachings are very friendly towards women. Especially, even I would say now, but especially if you want to look at Greco Roman culture at the time where he was doing his ministry, where women were subordinated and just truly terrible ways that for us in the industrialized west it’s unimaginable. Speaker 2: It’s possible to be super progressive for your time, and then, well, after 2000 years and that’s how long it took. Not as progressive anymore, but there’s that whole, what’s that role? 10% change per year thing. You don’t try to … if you try to get somebody to do more than 10% change you’re going to get a lot of blow-back. Speaker 3: Well, that may actually been a little bit of what was happening with Paul and with the early church is, if you read the book of Acts the early church was truly radical. Radical in every measure, radical in their theology, radical in their treatment of women and the treatment of outcast groups, and the treatment of all sorts of minorities. They were truly radical in their economics that they just threw aside all sense of private property and held everything in common. They had absolute communism. Speaker 2: From each according to his means, to each according to need. Turns out Marks is quoting the Bible. Speaker 2: I mean, other examples of that would be like, where it says in some of the epistles about, you’re submitting to your government, and of course there have been plenty of points of conflict between church and government in terms of what is the correct thing to do. Speaker 3: The early church was regularly persecuted, thrown into the coliseum and ripped apart by wild animals, they were crucified. Peter has said, “This is Christian lore.” Peter said to have been crucified upside down. Speaker 3: Persecution was no joke for the early church. However, we feel today about some of the let’s say, maybe a compromising things in some of Paul’s letters. I think we at least got to have sympathy that they were in a pretty tough spot, and it would have been very, very tempting to soft pedal a little bit, some of the stuff that makes you seem like a cult. Speaker 2: I’m looking at the discussion questions to try to see which ones we didn’t hit just in the course of talking. I think we’re good to go on the first one, the old covenant involved in the nation state, but the new covenant involves the Church. So, what implications that have for understanding of our relationship to the state? I think we were sort of just hitting on that. The discussion questions for this chapter, the first one says, the old and new covenant scriptural concepts, commonly known early friends. What about the concept you find your soul? I think we’ve pretty well covered that. Speaker 2: The second one talks about the nation state versus the church, and what implications does that have for our understanding of our relationship to the state, which I think we also discovered. Plus the last time we touched on the two kingdoms. My kingdom is not of this world thing. Speaker 3: Okay. Did we? We don’t need to cover it then. I’m sure it’ll come back up naturally in many episodes. Speaker 2: Question number three says, being spiritually connected with others through Christ is the basis of true sharing among us, and then essential elements of the new covenant. How can we distinguish sharing based on our connections through Christ, from sharing based on common backgrounds, interest situations or emotional needs? Speaker 2: Yeah, we’re really weird. Speaker 3: Regardless of what part of Quakerism you get into, Quakers are strange individuals, and a strange group. What’s been interesting for me is to find out that, for example, I’m an Esperanto, so I speak Esperanto the international language. When I’ve been in that subculture, there’s some weird folks too, as you might imagine. Right? Speaker 2: Also, I note that you are not the only Quaker I know who’s studied Esperanto. It seems to be a thing among Quakers. Speaker 3: Yeah. I don’t know. I’m not sure about that, but I noticed that, Esperanto there’s some similarities, just superficially between Esperanto culture and Quaker culture in terms of … Esperanto’s we will put one another up in our homes as a matter of course and Quakers do that too. We literally have our own language, Quakers have our own language too, in a certain sense. We have a sub language that we use among one another of this very distinctive, and if you hear to use certain phrases, you know they’re either a Quaker or trying to act like a Quaker. Speaker 2: Trying to get a meeting house to have my wedding in, the meeting that I called, they were like, “Oh, well we don’t rent out.” I was like, “Oh, you only do what? You only allow weddings that are under your care.” They went, “Oh, okay, what meeting are you with?” Because I said, under your care. He was like, the magic. I’m a Quaker too words. Speaker 3: That’s interesting. For me, another example, which you and I will both be familiar with, you more so than me is, in the tech community, there are all sorts of subcultures and different languages, and frameworks, and technologies have their own tribes built around them. These are weird people, these are strange people who do strange things, and the strangeness build group solidarity. Speaker 2: It’s okay, you can call us nerds. Speaker 3: These were Jesus nerds, right? They came together around their shared nerdiness around Jesus, but at what point … This is a human thing, this is a thing humans do. At what point is our religious community, so to speak distinctive from all these other communities that are equally bound up together and shared, Lingo’s and practices and quirks. Because, sometimes it seems like our lives can be and aren’t very different from Esperanto club or the computer language convention or whatever it is. Speaker 2: The fact that what we’re getting together to do when we have our meetings for worship or when any other church has their services, what we’re getting together to do is to connect to Christ together. So it’s asking, sharing based on our connection through Christ. Well, the question through Christ is what we’re there for. Speaker 2: Question number four in this chapter says, what is it to know God directly? How do we discern who truly knows God? How do we know if we do? How can we distinguish the spirit’s leading in voice from our personal impulses, preferences, and thoughts or the leading voice of other spirits? I think I wonder if we’re back to the fruits of the spirit in 1st Corinthians chapter, whatever. It’s either 12 or 14, it’s on one side of the love chapter. Speaker 3: Yes, somewhere in there. It’s probably 12. That’s a really intense question with so many parts to it. Speaker 2: It’s also for questions they put only, they put a single number, and the list of four questions. Seems like challenging. Speaker 3: To be totally honest, I feel like that set of questions right there could be an entire podcast. I really do. Speaker 2: Half of that podcast episode would be. How do you know when to speak in pidgin? Speaker 3: Or to speak at all? What’s the last question? Speaker 2: What other implications of the new government impress you especially? Speaker 3: For me, the piece that I’m chewing on the most right now about the new covenant is this movement from being biological, being nation based, being based in the communities that we normally interact with understand. To a movement that is transnational, transethnic, and in some ways trans ideological. Speaker 2: I would say it’s very trans ideological. Speaker 3: Why would you say that? Speaker 2: Even if you just want to look at politics as one sliver of ideology, you find Christians ranging all the way across the political spectrum. Speaker 3: Well that’s true, but I’m particularly thinking of have. To be honest I don’t necessarily think that all people who call themselves Christians are really following Jesus. Speaker 2: Well, yeah, we were both lapsed. Whatever’s at one point, I was a lapsed Catholic, you’re lapsed Quaker. Speaker 3: When I say trans ideological, I’m thinking of even movements like the early church, like the early Quaker movement, perhaps like the early Pentecostals, the early Wesleyan movement, many other movements, that seem to be clearly spirit lead and set on fire by the Holy Spirit. Just to use the early church as an example, there were people within the early church, some of them were deeply committed to the Jewish law. There are others like Paul who are actively preaching, and teaching, and growing communities that barely referenced the Jewish law at all. Speaker 3: That was an ideological difference, that the early church somehow, through the guidance of the Holy Spirit was able to bridge. Ultimately, the church decided, “well, there’s just two rules, don’t participate in sexual immorality and don’t eat blood.” That’ll do for the law, internally keeping Kosher. Speaker 2: Don’t eat blood stuck around? Bad news for France of blood pudding. All right, we’re out of time. This is the part where I say, tune in next time for section 1C, Atonement and Reconciliation with Our Creator because everyone likes to talk about atonement. This is going to be another one of those ones, where we know very sharply the distinction between Quakers and a lot of other denominations. Speaker 3: Who knows this next podcast might end up causing a split and several yearly meetings. Anything could happen. Speaker 2: On that note to the folks of Northwest Yearly Meeting, we’re praying for you. Speaker 1: You can find us on the web at quakerpodcast.org, on Twitter as Quaker Faith, on Facebook and on iTunes.